Pies are such a pain in the neck to make, even when you’re cheating. First it’s the pastry base, then the filling, then the pastry top…but if your kids are old enough (like mine have just become) to understand that they shouldn’t touch the hot, hot ramekin bowl that their pie is served in – well, it makes life a lot easier. There goes those pesky bases, right out the window! 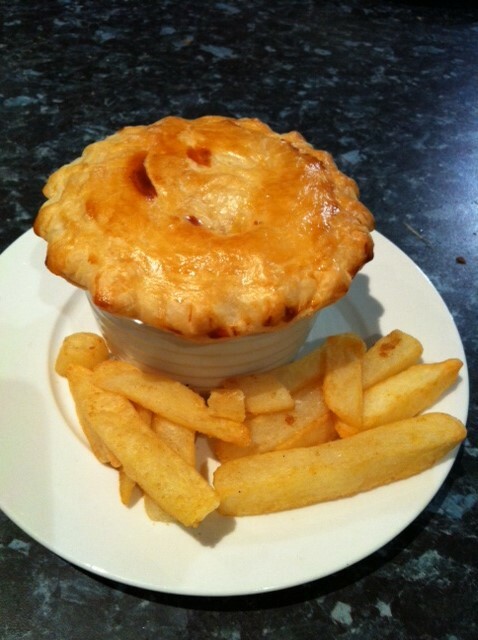 Suddenly, pies can become one of the quickest, easiest and of course, yummiest home baked meals. *1 store purchased BBQ chicken. Use the fillets, chopped (yes, of course you can cook up a couple of chicken fillets yourself – but this is the cheat’s version, ok?). *8 rashers of bacon, trimmed of fat and rind and then chopped. *A handful of grated tasty cheese. *5 – 6 small ceramic ramekins, depending on how many people you need to feed! Into a hot pan, add chopped garlic and leeks. Allow the leeks to soften, then add your bacon. 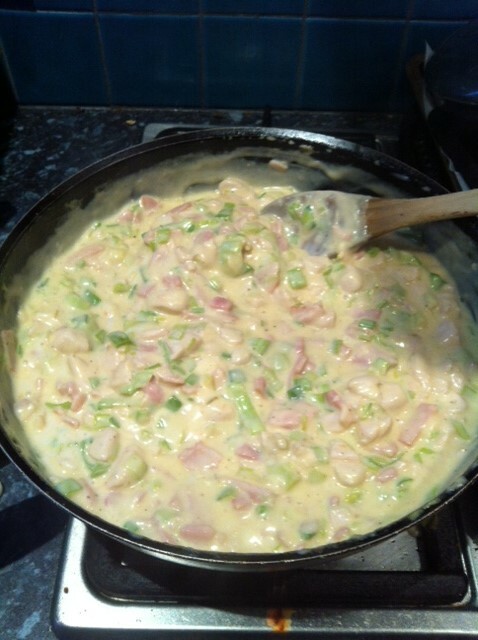 Once that begins to brown, add chicken, Bechamel sauce and milk (or cream). Allow to simmer and reduce until mixture is thick. Finally, add spring onions (we like ours to stay a little crunchy) and seasonings. Turn your pan off, and allow it to cool slightly, before stirring through grated cheese. 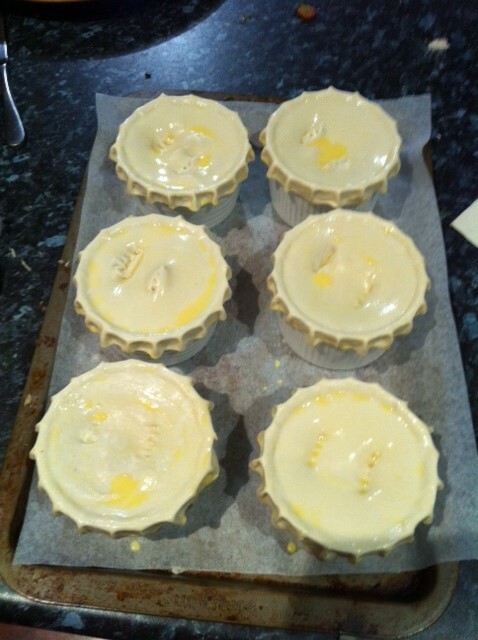 While your mix is cooling, pre-heat oven to 180 degrees C. Thaw out your puff pastry sheets, and cut to size big enough to cover the top of each ramekin. I use a small saucer as a guide. Place a ladle-sized scoop of the chicken and leek mixture into each ramekin, filling it to about ¾ full – allow for some bubbling while it’s cooking. Then, splash some egg wash around the perimeter of the ramekin with a pastry brush, and pop the pastry lid on, pinching it firmly around the edges. Prick the tops with a knife or fork to allow steam to escape, and give the whole thing another go with the egg wash.
Bake for around 15 minutes, or until the pastry tops are golden brown. 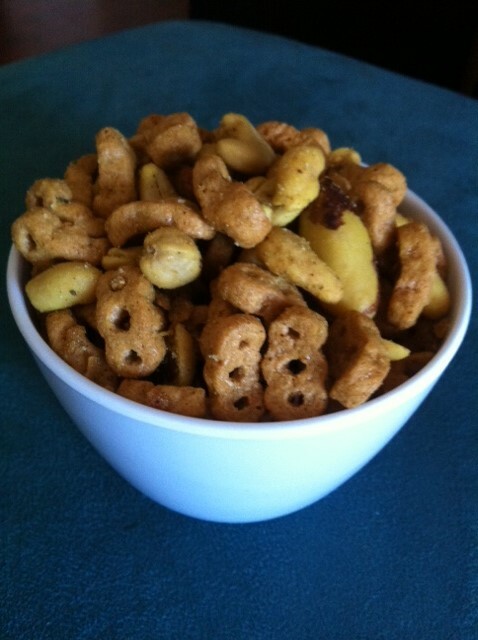 Serve with chips and vegetables. And don’t forget to remind the rest of your family that the ramekins are hot! Okay, so here’s the admission – it took me three goes to get these right. That’s good news for you because I’ve already made the mistakes, and the resulting recipe is dead easy. Voila! Enough to ewwww! the most seasoned Halloween goer! Small, round cutter – I used the end of a piping nozzle. Mix about a cup of boiling water with a tablespoon of gelatine, stirring well to get all the lumps out. Add a couple of drops of your desired iris colour – I found pale blue to be the most (ahem) authentic. Pour into the flat bottomed plastic container and refrigerate. This mix shouldn’t be more than 3mm thick. While the iris mix is setting, pour the cream and milk into a small saucepan and, while stirring, bring to the boil. Turn down the heat and add caster sugar, stirring until it dissolves. Remove from heat and add the bubblegum flavouring (I used ‘Robert’s Confectionary’ brand, and found I needed about 2 capfuls to get enough flavour). Refrigerate. Your iris mix will be set by now, so remove it from the fridge and run the wooden skewer around the outside of your jelly mix. It will lift easily out of the plastic container and feel quite rubbery. Place it on a sheet of greaseproof paper, and with the round cutter, stamp out as many ‘irises’ as you need. 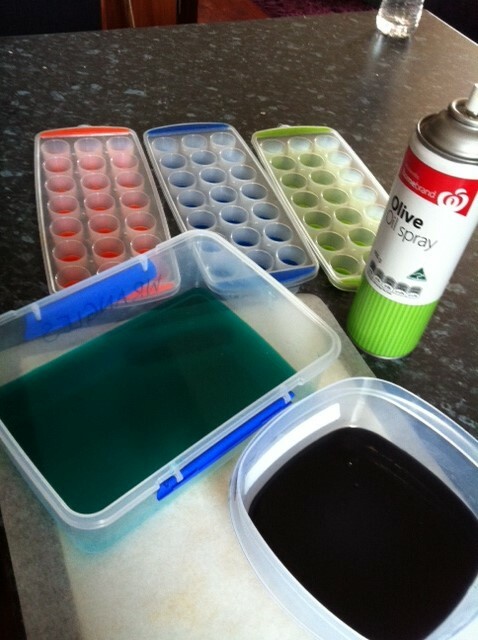 Lightly grease the ice-cube trays with spray oil, and place one iris piece at the bottom of each rounded cube. Your bubblegum cream mixture will be chilled by now (very important not to use it hot – it will melt your irises), so remove it from the fridge. Add about half a cup of the mixture back into the saucepan, along with 3 tablespoons of gelatine. Stir over a low heat until the gelatine is dissolved. Now, workingvery quickly (it will set fast) add the warm mixture back into the chilled cream mix. Stir or whisk to combine. 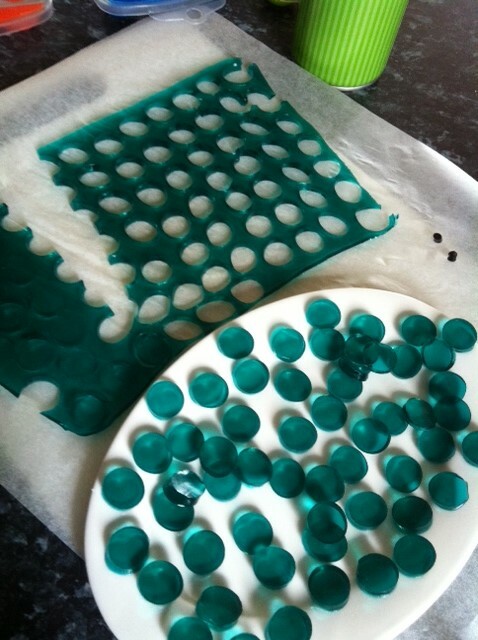 Making sure the entire mixture is cool or at least room temperature, add a teaspoon or so to each ice-cube mould, pouring directly over your jelly iris. Refrigerate again. 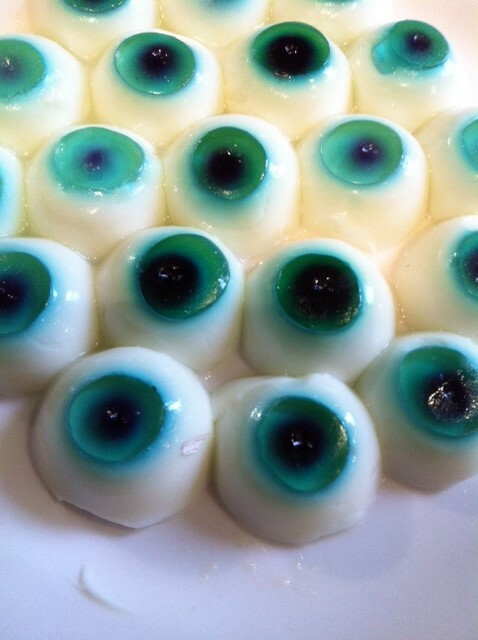 Once set, gently remove your eyeballs from the ice cube trays, again using the skewer. Place flat on the tray or plate that you plan to serve them on. 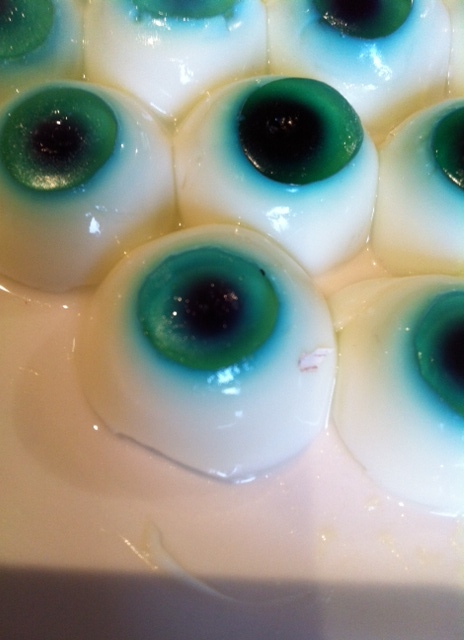 Add a couple of drops of black food colouring to a small glass, and with a fine paintbrush, dab a little in the middle of each iris, to form the pupil. Store covered in cling wrap in the fridge. 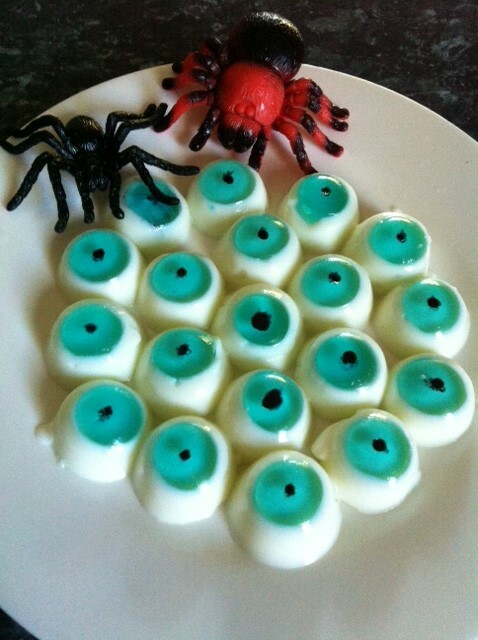 I found the eyeballs looked most authentic the next day, after some of the colour had leached into the cream mix, and the black food colour had soaked in. 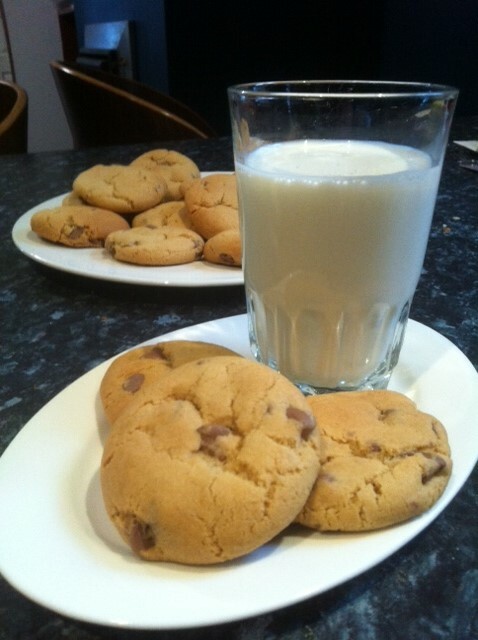 If you’re feeling particularly creative, you could always serve these with a drizzle of red food dye, or even mashed up raspberries on the side. Pavlova is one of those recipes that some people are known for – we all have a Great Aunt Gertrude whose pav is a thing of family myth and legend – and others are terrified of. Truth is, pavlovas are a really, really easy to make as long as you don’t rush things. There’s no great secret to getting a perfectly crispy shell and a soft, marshmallowy centre – just patience and a few simple rules. For Decoration: 250ml cream, a teaspoon of vanilla essence, a tablespoon of icing mixture and 3 Peppermint Crisp chocolate bars. Pre heat oven to 130 degrees C.
160ml of eggwhite is what you’ll get from about 5 standard sized eggs. 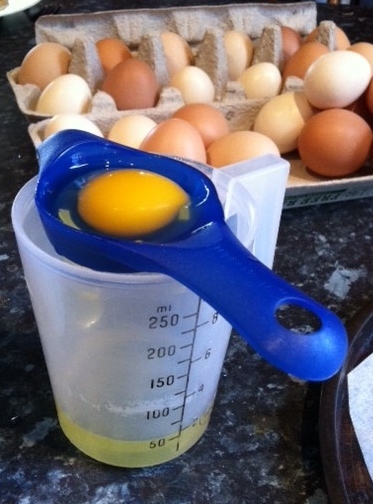 But as you can see from the photo – eggs at my place don’t exactly come in standard sizes! We keep our own backyard chickens in a couple of different breeds. So I find it’s much easier to measure the eggwhite instead of assuming 4 or 5 eggs will do it. Also, if you’re like me and useless at separating the whites from the yolk, check out this groovy little gadget that does the job for you. Easy! Okay, so into a large mixing bowl, add your 160ml of eggwhite and, using an electric beater, mix on medium speed until the whites turn…well…white, with soft, foamy peaks. This will take about 4 or 5 minutes. Slowly add the caster sugar, a little at a time. Keep beating on medium to high in between sugar additions. Before adding the next lot of sugar, make sure the grains from the previous addition are completely dissolved. 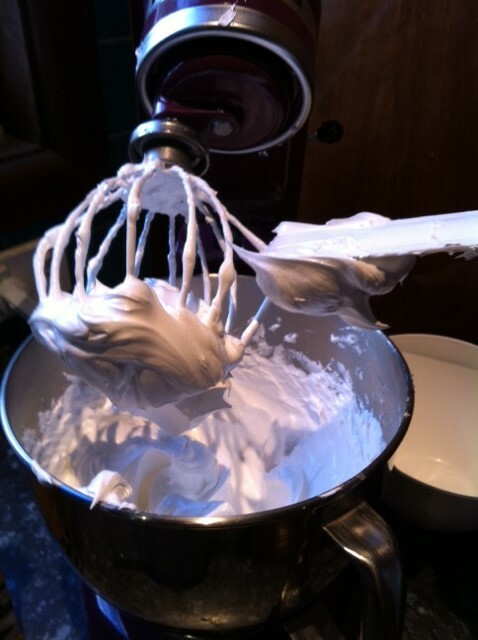 As you whisk, you’ll find the mixture growing and changing texture to a firm, glossy meringue. I find I’m usually whisking for at least 20 minutes. Add the vinegar and cornflour and mix gently until combined. 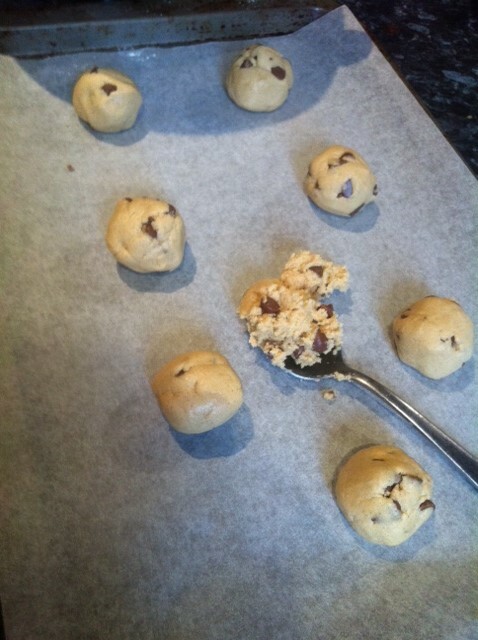 On a round baking tray lined with baking paper, begin to pile up the mixture. Again, don’t rush this bit, make sure there’s no air left underneath, the sides are fairly straight and bear in mind that the meringue will spread a little as it bakes, so it’s better to pile it high. Add to the pre-heated oven, and turn the temperature down to 120 degrees C. Bake for 1 hour, 30 minutes. Turn the oven off, and open the door a little. 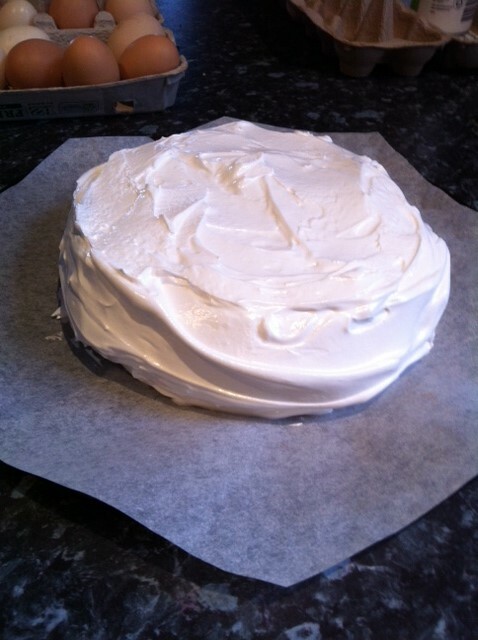 This allows the pavlova to cool down slowly and there’s less chance of it crashing! While the pav cools completely, head back to the electric beaters and whip up the cream. I find adding icing mixture helps to stabilise it a bit, and gives a thicker result (that one’s a hint from my Mum). Add vanilla, too. 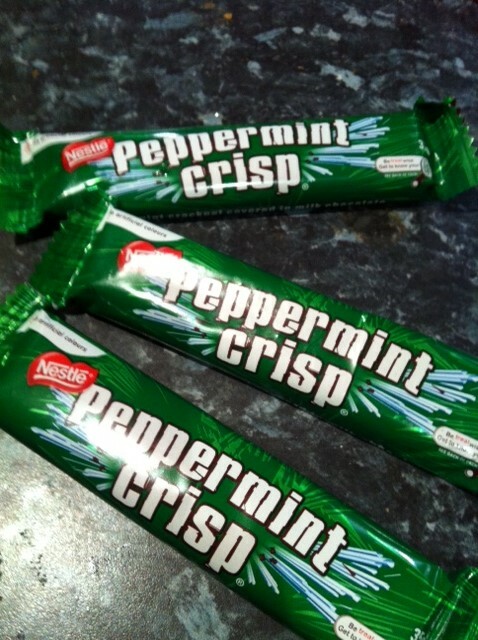 Crush the Peppermint Crisps by whacking them on the edge of the bench-top while they’re still in their packets. No mess! Once your pav is cool, very, very carefully transfer it with a spatula to your serving plate. 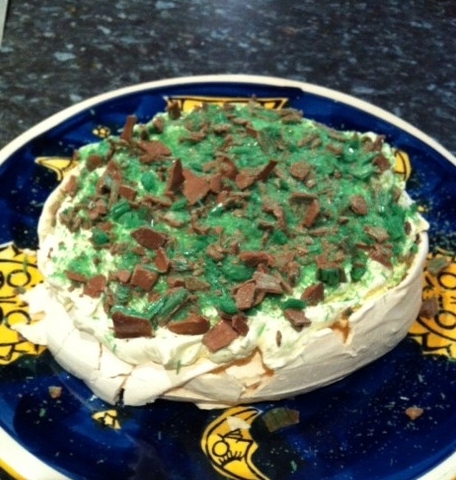 Break up the meringue on top, pile on the cream and sprinkle loads of the crushed up Peppermint Crisp, and you’re ready to go. 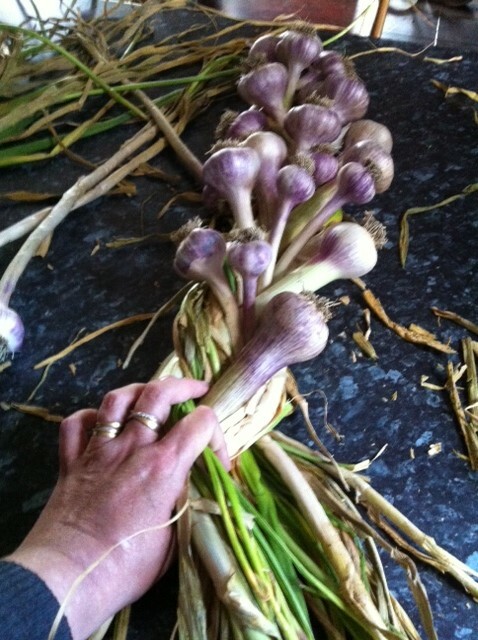 Last weekend I pulled our crop of garlic. I’d grown the odd bulb before, but never in any sort of numbers. 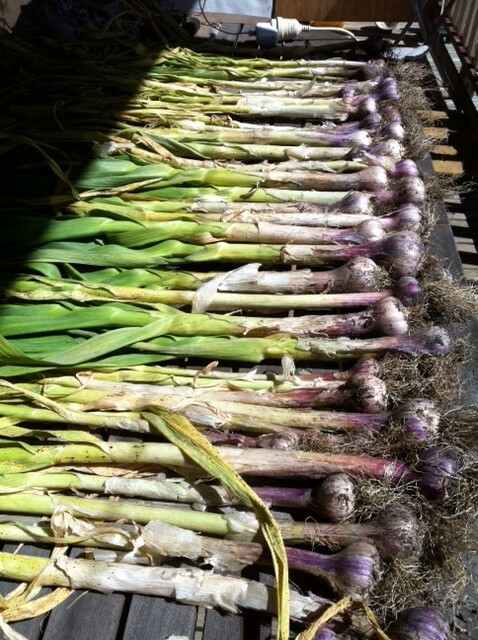 Garlic has got to be the easiest thing to grow, ever. Just break up a shop-purchased bulb and pop each piece into the ground, pointy end up. And then forget about them. That’s it. Seriously. And pests don’t find it all that tasty, so it acts as a repellent for your other plants too. So over this recent winter, I dropped heads of garlic in wherever I had a few spare centimetres of space, which meant about 60 bulbs that needed something done with them all at once. But what to do? Well, as an ex-hairdresser the answer was obvious. Braid them, of course! 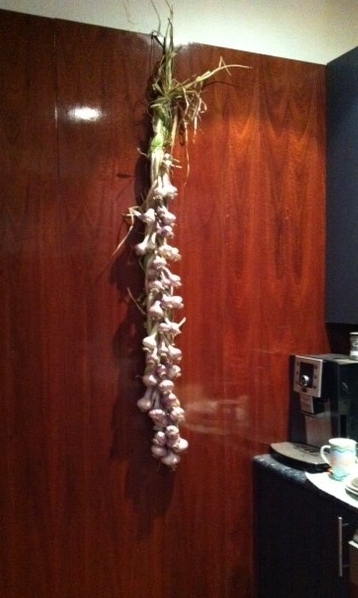 I let the garlic dry outside for the week undercover and protected on a table. Then, (and trust me, this next bit is best done outside too) I trimmed the roots from each bulb with scissors and gave them a gentle dust off with a pastry brush. You want to remove as much dirt as possible without damaging the fine, crunchy outer layers of your bulb. A heap of dry debris, dirt and muck ended up in my compost bin instead of the kitchen floor. Next, I sorted the bulbs into two piles – large and small and took them inside. Armed with a pair of scissors, some kitchen twine and muscles, it was time to begin. First, gather 3 biggish bulbs and tie together with the dried ‘stalks’ pointing towards you. 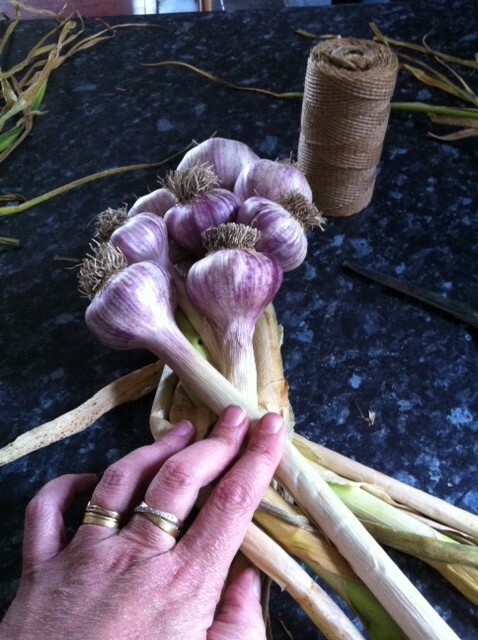 Using a simple plait technique (right over the middle, left over the middle, right over the middle, left over the middle…you get the drift), add in a new garlic to each middle strand. To fill gaps, I sometimes used two smaller bulbs. Keep the plait as tight as possible, which means working slowly and using those muscles. As your braid grows, it gets tougher to work with and some of the stalks aren’t as pliable as others – but they can be coaxed! We eat loads of Japanese food at our place. It’s healthy, clean and doesn’t make you feel like you need a nine hour nap when you’re done feasting. 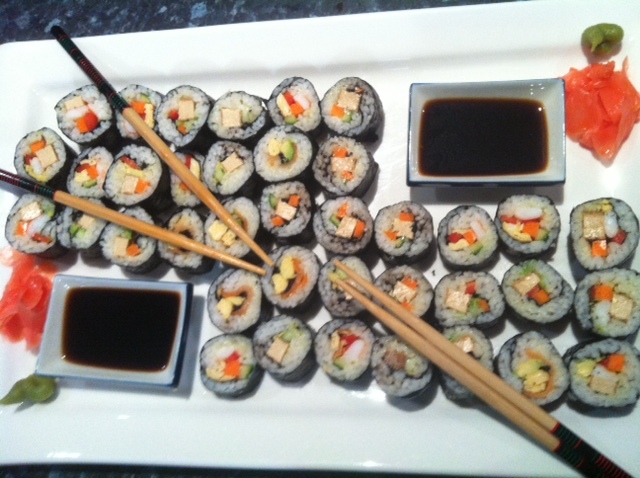 But best of all, one meal can cater for everyone’s tastes – especially when we do these sushi rolls. *Sushi rice. Don’t try and swap it for another type of rice – it just doesn’t work. You can find all these Japanese ingredients in the Asian section of your local supermarket. *Nori – aka flat sheets of seaweed. *Wasabi – green Japanese horseradish. Optional, and packs a punch so use it sparingly. *Japanese ginger to serve – optional. *Japanese soy sauce to serve. 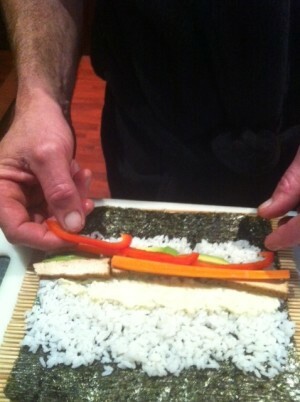 *Fillings – now this is where you get to customise your sushi rolls. 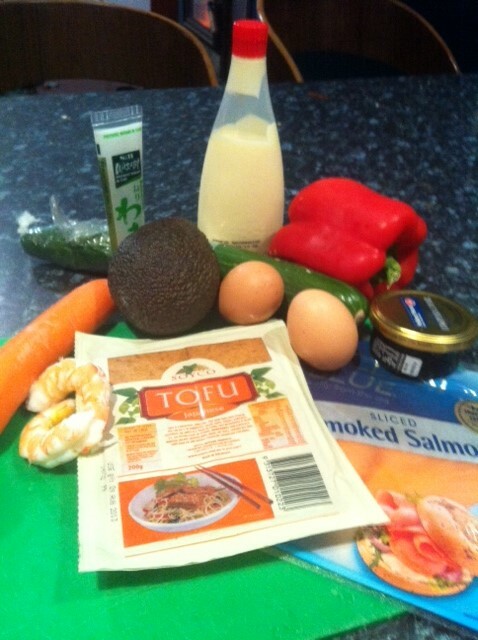 At our place, favourite ingredients include: carrot, cucumber, capsicum, tofu, salmon (raw from the fish shop – make sure you ask for sushi grade) as well as smoked salmon, caviar, egg, avocado and prawns. You could also use crab meat, lettuce, shredded chicken or tuna. It’s all in how you roll! Rice: First up, you need to cook your rice. Add equal amounts of water and rice to the pot – eg: if you use two cups of rice, add two cups of water (this is the amount used to make the sushi rolls pictured). Bring rice to the boil for about 3 minutes, then reduce heat to medium. Once the water is just about absorbed, turn to low for a further 5 minutes, then turn off the heat and let rice stand 15 minutes with the lid on. Stir through 2 tablespoons of rice vinegar. We usually cook our rice a couple of hours before it’s needed and refrigerate until needed. Filling: Slice all ingredients into strips. Carrot, cucumber, capsicum, tofu (my favourite! ), avocado etc. With the egg, make a plain egg omelette and then slice into fine strips. Prawns and other seafood can also be sliced. The key here is to be organised, with everything ready for rolling on the bench. Roll ‘em up! This can be tricky the first time, but it gets easier with practice. Lay your sheet of nori on a sushi mat (also available in the Asian food section at the supermarket). Spread your cooled rice evenly over the top, leaving gaps at the top and bottom. Then, add your fillings, including mayonnaise or wasabi. It’s much easier to roll if you don’t add too much, especially for beginners. Once you’re loaded up, start at the end closest to your body, use the mat to guide your nori, and roll up and away from yourself. Be firm, take it slowly and remember to tuck the end closest to you. 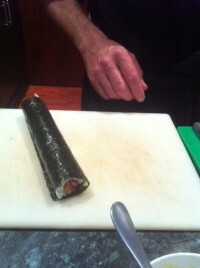 Once your sushi roll is rolled, it should resemble a long cylinder. Pop it aside, and start on the next one. Repeat. Refrigerate for 10 or 15 minutes to make the rolls easier to slice, using a VERY sharp knife. Again, take it slowly and try to slice your rolls evenly. We usually discard the end pieces. *With thanks to Simon, my very special hand model!